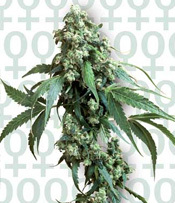 Growing: Â Easy to moderate This hybrid marijuana strain is the result of crossing Jack Herer with Super Skunk. The result is a 65% sativa and 35% indica weed plant that can grow ideally in an indoor set-up but can also flourish outdoor if it is raised in an environment with lots of sunlight and long summer. Â It grows to a tall plant and grows even faster during its flowering stage. Flowering time for this hybrid is expected in about 55-75 days from the time it begins the vegetation stage. Â Give it more time to finish its vegetation and it can achieve its maximum potential. Â It will grow lots of buds and the grower can expect high yield from this hybrid. Â The effect when smoked is a combination of its genetics and can induce a very decent high and stoned feel that can rival the other champion strains in the stable of Sensi Seeds. To be fair I havenâ€™t grown marijuana but Iâ€™m really serious about doing it and would like to start with Jack Flash #5 to find out if itâ€™s really good.